All our B-Compact guitars are equipped with the unique S.N.A.P. system (Simple Neck Attachment Procedure) which makes assembly and disassembly unbelievably quick and easy. Even though the neck can be completely removed, there is no detuning of the strings required to take the guitar apart! Assembly only takes half a minute and requires hardly any tuning! The Gotoh “string locking” tuners and the special nut design prevent the B-Compacts from going out of tune and keep the strings organized and tangle-free when the neck is released. Comfortable playability, precision engineering and finely crafted details belong to the standards of the B-Compact guitars. For all further details keep scrolling down. These are standard specifications to all available B-Compact models. The B-Compact full-size body is great for those who don’t want to compromise on sound for compactness. The B-medium body size is an excellent finger style guitar with a very quick response, is nicely balanced and also offers nice bass resonance. This body size is offered for regular full-scales, baritone and bass scales and it also used on our harp guitar models. This body size has proven itself to be a perfect compromise between compactness and still sounding like a real guitar. Many have been blown away by its surprisingly rich warm sound and its volume. 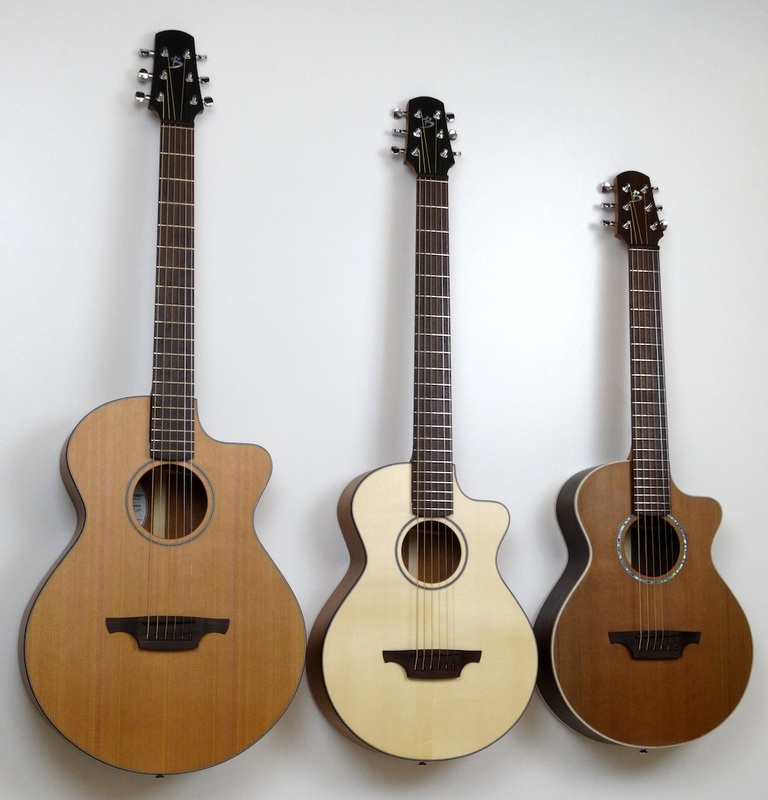 The B-Compact small body models are offered with either short or full scale, and as acoustic or slim body electric. Assembling and disassembling the B-Compact guitars is quick and easy as you can see on the video. This procedure applies to all different B-Compact models and sizes. When I first offered the removable neck guitars in 1997 the concept looked very much the same, except the neck was simply bolted on from the back. Right from the beginning the main goal was to not having to loosen the string tension for removing the neck so the guitar would be very closely in tune again when you reassemble it. So I first invented the “hinge plates” which make it possible to remove and put on the neck under full tension without wear. The one brass plate on the body has round lip along the top edge and the neck plate has a 45° angle making the neck slide nicely in the place when it’s pressed down. With the previous bolt-on connection you had to pull the neck backwards holding the tension while setting the bolt from the back. This simple solution worked great, but I wanted to make it more user friendly and so in 2005 I developed the S.N.A.P. System (Simple Neck Attachment Procedure) where neck simply “snaps” on and you don’t need to hold that tension while you secure the connection with the strap holder knob. This way attaching and removing the neck has become a real “snap” ever since! These high precision CNC milled Aluminum/Brass units are custom made exclusively for Brunner Guitars. 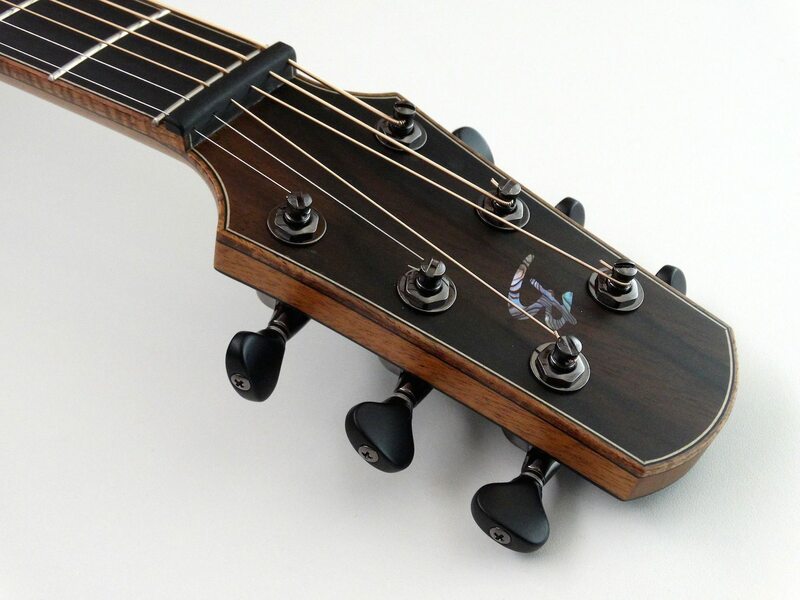 The Gotoh “string locking” tuners and the zero fret nut design with the unique wooden “strings in place holder” prevent the B-Compact guitars from going out of tune and keep the strings organized and tangle-free when the neck is released. These fibre glass hard cases are strong without being too heavy. The clasps and hinges are of good quality and a new nice feature are the detachable backpack straps. Also the handle is of high durable quality and super comfortable. The hard cases are available for the both, the full size and the small size B-Compacts. Two foam bars are attached to the bottom with velcro for fixing the neck. A middle protection layer fits on top of the up side down guitar neck with the string looped to the side. The body simply sits on top. 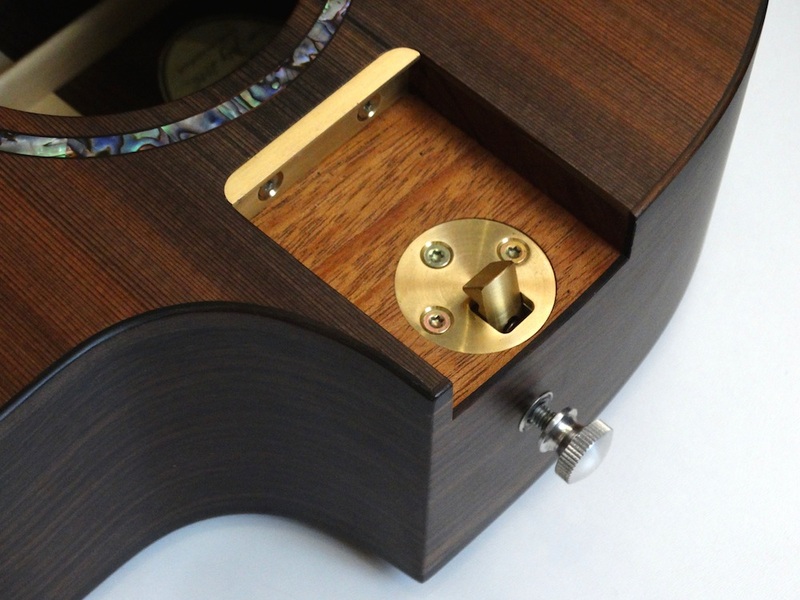 There is an additional spare strings compartment placed in the short neck section of the lit. The hardshell cases are only offered for the BC small-size short-scale and the BC full-size with regular full-scale models. For all electric models and all longer scaled necks we can only offer the BC backpacks. The quality BC backpacks are great for day trips with your B-Compact or where ever you like to travel light! They are made after the same concept as the hardshell cases, yet they are much lighter and offer more storage room for extra items. As a backpack they are super-comfortable to carry, and with their thick padding, they offer decent protection for your B-Compact guitar. The fabric and zippers are of high durable quality. The fabric being fully waterproof, the backpack are quite water resistant for lighter rain showers. 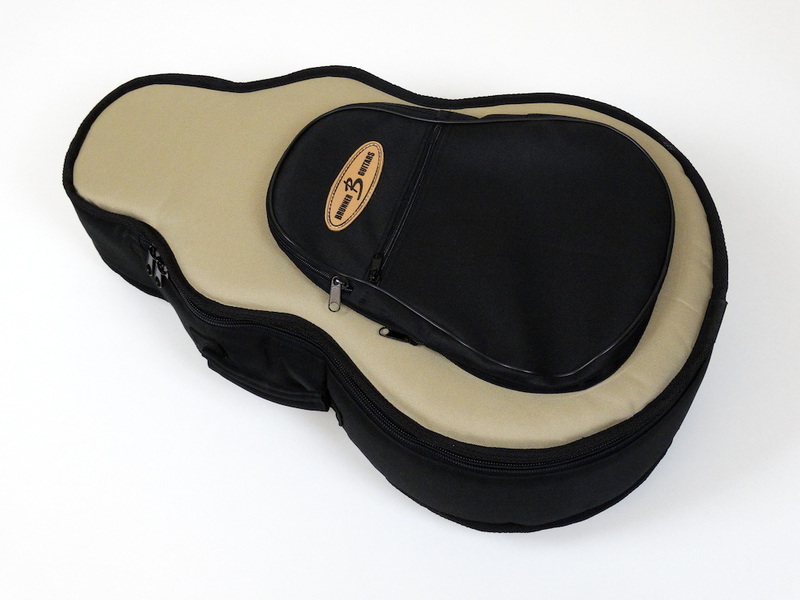 Unlike with the hardshell case, the soft bag lid flips open towards the neck and becomes a nice neck support when the guitar is assembled. The BC Backpack is offered for all BC sizes such as the full scale, full size, the slimmer electric and also the double neck and harp models. All additional exchangeable necks come with these bags in the right length with a detachable shoulder strap. Even though only the BC small-size short-scale backpacks are within all airline restrictions (when the bag is tilted to the side it’s no longer than 55cm), I have never heard of anyone who had trouble to carry-on any of the bigger sized bags and cases. However, please be aware that some of the bigger sized bags like the BC harps could give you trouble, especially on small planes. The fact that these are soft bags helps though, they can be compressed a little in all directions.